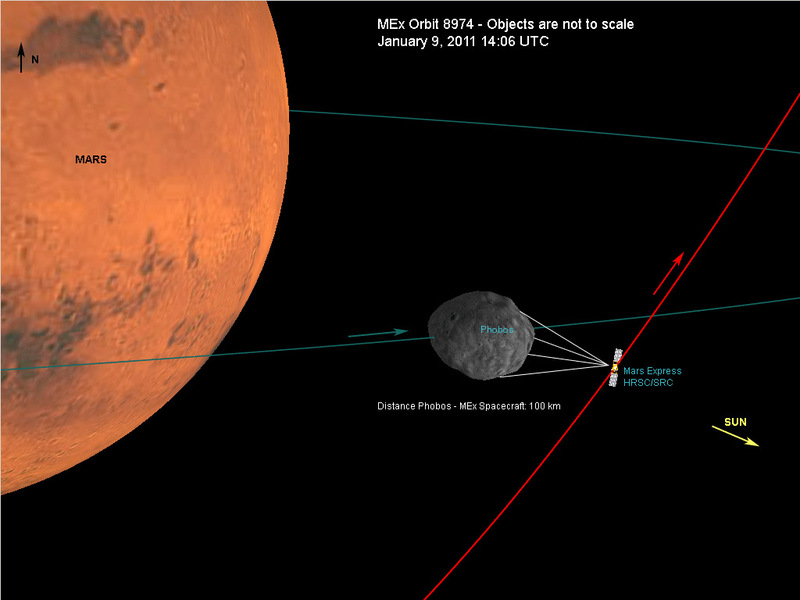 The geometrical relationships between Mars, Phobos, and Mars Express at the time of the sequence. This image has been photometrically enhanced to illuminate darker areas. Resolution: 3.9 meters per pixel. 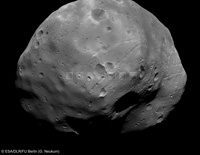 The HRSC-camera recorded images of Phobos on 9 January 2011 at a distance of 100 km with a resolution of 8.1 m/pixel. Due to the stereo viewing geometry during the flyby a small part of the moon's edge is only visible for the right eye resulting in odd 3D-perception in this area. This part has been slightly adjusted for better viewing. Also, for the left eye at the left edge of the image four small data gaps have been interpolated. Superimposed on the HRSC-nadir image are 7 SRC-images with a resolution of about 3 m/pixel. 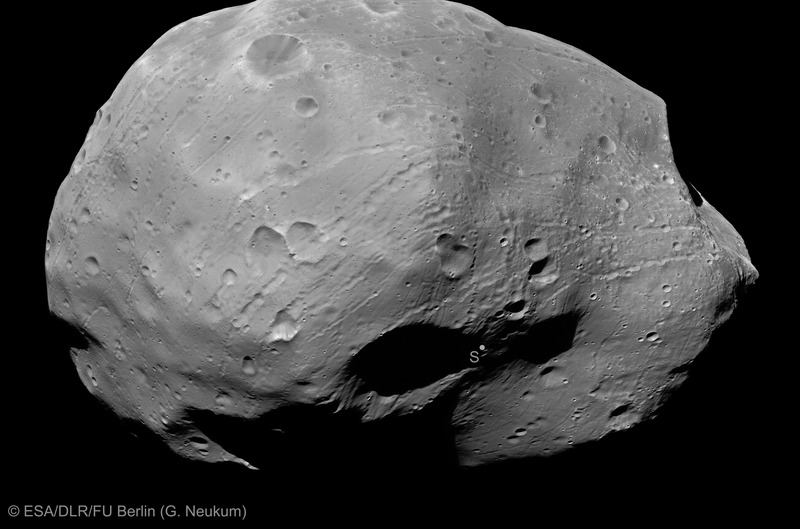 The Super Resolution Channel images show more details of the surface of Phobos. Sequence of 5 HRSC-channels, orbit 8974: (left to right) stereo S1 (4.1 m/pixel), photometric P1 (8.1 m/pixel), nadir ND (3.9 m/pixel), photometric p2 (8.2 m/pixel), stereo S2 (4.3 m/pixel). 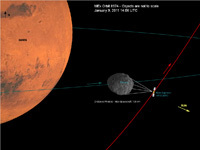 Image of Phobos with a resolution of 8.2 m/pixel in orbit 8974. 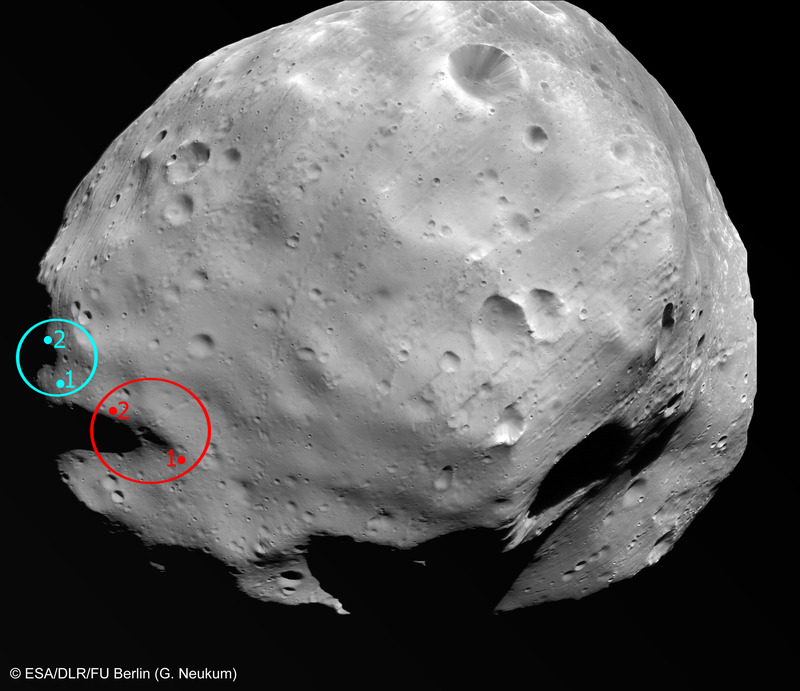 The ellipses marked the previously planned (red) and currently considered (blue) landing sites for the Russian Phobos-Grunt mission.